The Board values attitudes and practices that encourage integrity, respect and trust in all relationships. To this end, the Board expects district, school and program level decisions will be made using appropriate consultation processes. The process selected will optimize the opportunity for educational and community partners to provide input within the predetermined timeframe. 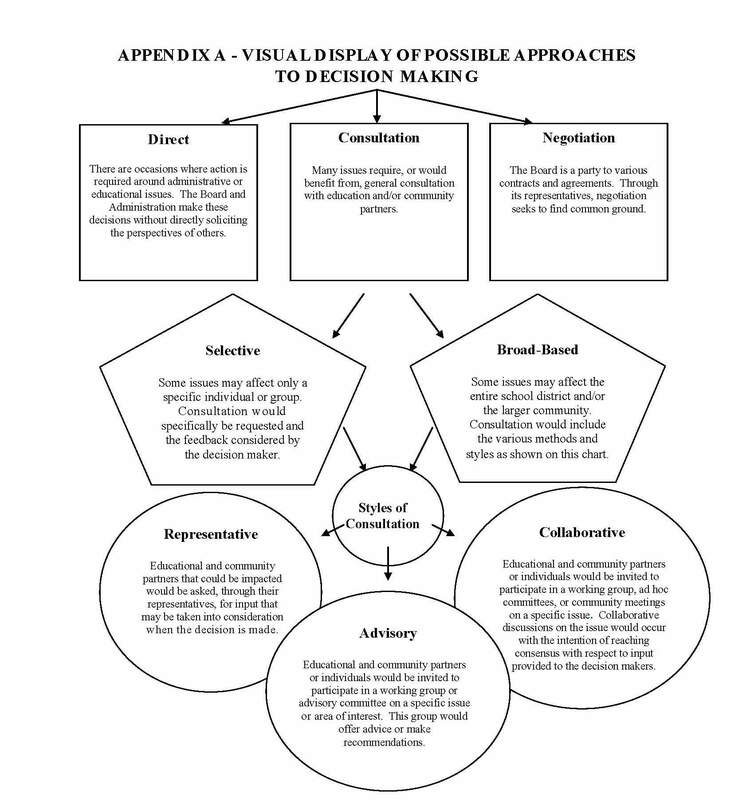 Consultation is an important step in decision-making (See Appendix A). It is a process, not an outcome, which involves interaction between decision makers and those affected by the decisions. It promotes a two-way flow of information and ideas to arrive at better solutions and, consequently, more effective implementation of policy and programs. Student-focused: The benefits of consultation are realized when educational and community partners are focused on the best interests of the students. Understanding and Commitment: Consultation processes function more effectively when all parties understand them, have a basic commitment to them, and have access to them. Ownership: The implementation of decisions is more effective when educational and community partners have shared in their development. Timeliness: Consultation is more effective when it is commenced at the time that the issue being considered is identified. Transparency: Communication, trust and open-mindedness are critical elements in consultation processes.